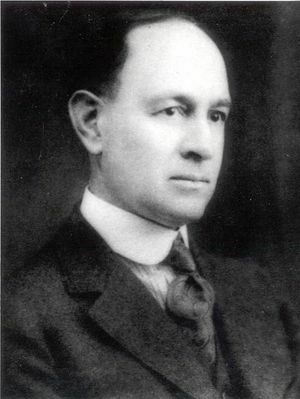 Walter G. Cady, IRE President, 1932, studied crystal resonators in radio frequency applications, which later led to him being granted two patents for his research in 1922. Walter Cady was born in Providence, Rhode Island in 1874. His academic career began locally. He earned his undergraduate degree at Brown University in 1895, a Masters degree in 1896, and then went on to teach at the university for two years. He travelled farther afield for his doctoral work, which was completed in 1900 at Germany’s University of Berlin. Cady then returned home to the United States and worked at a magnetic observatory for two years. He joined Wesleyan’s faculty in 1902, and stayed for 44-years. During his decades at the university, a number of theses on piezoelectricity were produced under his supervision. Dr. Cady studied arc discharges and wireless waves during the beginning of his career. During World War I, he worked with the US Navy on submarine detection research. This work spurred his later study of crystal resonators in radio frequency applications. His efforts in this field were recognized with two important patents in 1922 and findings were shared when he published an IRE paper in 1922. Cady also studied international frequency standards used by European countries. In 1946, Cady published a book on piezoelectricity that cemented his role as a leader in the field. Dr. Cady was an energetic member of his professional community. He was made a fellow of the IRE in 1927. He was active of the editorial board of Proceedings and served a short term as editor in 1929. Cady was IRE president in 1932. During World War II, Dr. Cady again contributed to the nation’s war efforts, finding further military applications of piezoelectricity knowledge. He, along with many other engineers, was connected with the Radiation Laboratory at MIT. Cady later estimated that 75 million quartz plates were made for the military’s use during the war, many of which for supersonic trainers for radar operators. After the war ended, the Navy continued to call on Cady as a consultant. Cady married Kathrin Olive Miller, who died in 1909, and had one son, Willoughby Miller Cady, who was also a physicist. In addition to his career interests, Cady was an active amateur ornithologist. After retiring from teaching Cady lived many years in Pasadena, California, and was a research associate at California Institute of Technology. At the end of his life he returned to Providence. Cady’s career was capped when he earned a patent in June of 1973. He died, on the eve of his 100th birthday, in 1974. This page was last edited on 8 March 2016, at 17:13.